After months of stressful work, I finally was able to take some holidays and headed south down I-81 early on Wednesday morning—really early, as I was on the road by 4:20 a.m. Needless to say there was not a lot of traffic and mine was the only car crossing the border at Hill Island ninety minutes later. The U.S. Customs official asked the usual question after I said I was going to a cycling training camp: “Where's the bike?”. Of course, it was in the trunk, as I explained, but then he asked what kind of bike it was. I guess perhaps I do not starved enough to be a serious cyclist or something so he wanted to test me a bit further. I was all set to explain that I had a Specialized S-Works Tarmac E5, full Dura-Ace with Hutchinson tubeless tires, but I thought that I did not want to spend a lot of time at the border crossing so I just said it was a road bike, which seemed sufficient. He was not very interested in the dozen bottles of fine Canadian beer I was bringing but I knew that there would be folks with some enthusiasm for these down the road. The drive was long but not very difficult. Getting up was actually the hardest part, and my stomach clearly could not believe that we were travelling so soon after going to bed, so I think I had to stop briefly at every rest stop on the Interstate in New York State to deal with digestive confusion. But once I crossed into Pennsylvania the internal rebellion was over and I gradually worked my way through my large collection of travel CDs, which ranged from two versions of Aaron Copland’s “Appalachian Spring,” to some German poetry to banjo music. There was heavy rain as I approached the Mason-Dixon Line, so having put in 9 hours of driving I made a brief stop near Chambersburg, Pennsylvania and picked up an especially strong espresso (and a pastry) at a Panera Bakery at a new shopping mall. The place was packed with extremely large people who had been eating a lot of Panera pastries, and would never have gotten by the Customs agent if they had claimed there were going to cycling training camp. Although the pastry tends to be on the really sweet side, I like the Panera chain very much as the food tastes fresh and the ambiance of the stores is quite pleasant. I had planned to have lunch but I had a serious supply of egg salad sandwiches in my cooler and I figured I would just keep eating these on the road. As I got back into the car with my espresso, I saw a Target store and I thought I would stretch my legs and do some quick shopping. I needed some cotton dress shirts and an article in the Wall Street Journal had tested various ones and the Target shirts, the cheapest in the article, came out very well. I had only been in one Target before and I have the impression that all of the stores are huge. It took some hiking to get to the clothing section, where I quickly found four shirts. I then looked at the electronics section and found one of the Flip Mino miniature video cameras I had read about. It was on sale and, in an extremely rare-for-me burst of impulse shopping, I bought it too. Back into the car, I continued south on I-81 until I reached Staunton, Virginia, a familiar place. A quick stop for gas did not turn out to be quite as quick as I had hoped since I discovered that my credit card could not be used! Back in Montreal, the Royal Bank of Canada was carefully watching my expenditures and saw that someone using my credit card had bought gas in Pennsylvania and then loaded up on stuff at Target to the tune of $250. Alarm bells went off but a lengthy telephone discussion, covering all my financial dealings with the bank in the last, oh, six months, convinced them that it really was me buying all those shirts and gas so I was not left stranded in Staunton. The rain had stopped soon after entering Virginia and it was a pleasant late afternoon as I drove by the places where I had cycled so often, including Staunton, Natural Bridge, wretched Troutville (surely the least attractive place in the Shenandoah Valley), Roanoke and Christiansburg, gateway to the Mountains of Misery ride. But after this it was Terra Incognita for me as I had never driven so far south down I-81. Although there was some traffic from Roanoke to Christiansburg, it soon petered out and I could look around. There was a sign for Tyler Auto Body, “serving the Lord and you!,” although I could not understand why an omnipotent deity could not do His own repairs, and a big sign for the Draper Valley Pentecostal Holiness Church, differentiating itself from the non-holy churches, and trying to attract custom from the golfers at the nice golf estate next door. As I headed south the scenery was similar, with gentle rolling hills and the Blue Ridge off to the east, but the grass was a bit greener and I saw more trees in flower, something that Ottawa will not boast for weeks. It was warming up and I drove with the sunroof open. Leaving the Interstate, I drove through downtown Wytheville, Virginia, and soon found myself on the complicated route provided by Mr. Google, travelling tiny roads through the hills, scenery that reminded me of the drive to West Virginia for the Cheat Mountain Challenge last year. I had all the windows open now and the banjo music was playing in the amber light of the early evening. The road was quite challenging to drive quickly and it prevented me from feeling tired. The hills had, in many places, been denuded of native trees (once all hardwoods, I think) and instead vast numbers of Christmas trees had been planted. I guess they have to come from somewhere besides Nova Scotia, but given the hardscrabble nature of farming on the Virginia/North Carolina border, I suppose tree farming makes sense. After driving for several hours, I finally came to Boone, a North Carolina college town and knew I did not have far to go. One final fill-up, and I was on the road for the last 17 mile stretch to Sugar Mountain. I noticed that the road was climbing pretty steadily and once I was in Sugar Mountain I saw that it started going up pretty seriously. The Duck had given detailed directions to the condo and I was impressed with the brutal 3 mile climb we were going to have to do after each day’s ride as I searched out the unit. I was able to find it surprisingly quickly, perhaps because the Duck’s son had prepared a welcoming banner on the door, which said: “Allez, Papa!,” and featured drawings of our racing bikes. I had the last of my egg salad sandwiches and relaxed with Duck after my 17 hours on the road, and the others soon made their way in. It was more difficult to find the place in the dark but soon we were all accounted-for, the beer was in the fridge and we were presented with our special custom-made Tour de Appalachians t-shirts! Excellent. Soon it was time to turn in and I was feeling pretty tired by this time. Day 1: Training Camp Begins! This was my first time in a ski resort condo and after looking at the place I fear it will spoil me for cycling trips in the future. It was very comfortable, with three bedrooms, a nice-sized kitchen and a giant dining room/living room that was two stories high. There was a balcony and a great view of the mountains outside. Actually, on the first day the view was not all that great. There was some light rain and our start was delayed a bit as we waited for things to clear up a bit. Duck had said that we might be joined by woman cyclist from the area, news we received with some trepidation: female company might raise the tenor of our society but a local cyclist would humiliate us on these climbs. As it turned out, she did not like to ride in rain and begged off but, being Men of Iron, we suited up. Of course, this was after telling each other how little we had ridden for the year. You never hear a cyclist say: “Why, yes, I have trained a lot this year and am quite prepared to hammer over the biggest mountains.” It is always: “Well, I didn’t get out on the road much,” or “Work has been pretty heavy,” “I never got a chance to overhaul the bike.” In my case, I felt pretty good thanks to all the time at the Tour de Basement, but was concerned that my measly four short road rides had included no discernible climbing. On the other hand, the Badger had gotten married four days earlier and I am sure that there was lots happening in his life beyond cycling, as was also the case of Young Jeff, who claimed not to have exercised, let alone ridden, since Cheat Mountain last August. The Duck rides regularly to maintain his sylph-like figure, while Tim the Tornado has been churning out frightening Big Power in his own Tour de Basement. We enjoyed oatmeal and bagels and peanut butter and had some hot drinks as the weather cleared, a bit. Our ride began with the 3 mile descent out of Sugar Mountain down some very steep-pitched curves that took us past the golf course and dumped us on the rather narrow and quite busy Highway 184, taking us in the direction of Banner Elk. We rode swiftly in single file and just before we reached the town we turned left onto Hickory Nut Gap Road. Meandering past Lees-McRae College (apparently enjoying the highest elevation of any U.S. college east of the Mississippi), and the Banner House Museum (home of one of the earliest settlers of Banner Elk) we found ourselves on a marvellous quiet road that twisted and turned and carried us through yet more Christmas tree farms. This road has been part of the Blood, Sweat and Gears century ride, as well as a feature of the pro Tour DuPont race. 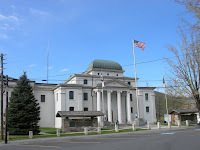 There was lots of climbing and descending to entertain us and before we knew it we reached the small town of Newland, the county seat of Avery County, with an impressive courthouse built in 1913. We were so impressed by Hickory Nut Gap Road that we turned around and rode back over it. We stopped briefly at the athletic facility at Lees-McRae College. There was a big trailer there belonging to the cycling team. Lees-McRae, a tiny college with 882 students, is a major collegiate force in cycling and has won a number of national titles in road racing and mountain biking, as indicated on the trailer. Impressive but if the roads we were riding were any indication, anybody cycling here would be trained up pretty quickly! We turned right at the stop light onto Highway 194 and began the ride towards Valle Crucis. There was a brief climb and when we crossed into Watauga County the road began to rapidly descend, giving us an exhilarating ride into Valle Crucis. We rode past an old stone church which looked like something out of the Old World (built in 1925, it was actually modelled after a Welsh monastery) and soon found ourselves taking a break in front of the Annex of the Mast General Store. This is an institution in the area, dating back to 1913 and in family hands until 1973. It served not only as a general store but as a kind of community center and now employee-owned it has shown that selling candy is always good business: the operation has now expanded to include nine locations. What goes down must go up as well and I was a bit concerned about all the climbing we were doing on the first day of our camp. Nonetheless, I felt good on the long climb back up to the county line. Tim the Tornado decided to take a break at the community garbage depot on the way up, suffering from the first flat tire of the trip. Back together, we rolled through Banner Elk and then began the long ascent of Sugar Mountain. I stopped to take off my rain jacket and then found that my climbing was actually quite good as I was able to maintain a steady pace on the road. There are some quite brutally steep sections and I was worried I might cramp up after all the climbing we had already done but I arrived back at the condo mid-pack and in good spirits. No rain to speak of, great scenery and good fun: Day 1 of the Tour de Appalachians was a huge success. We celebrated with beer and homemade lasagne, courtesy of Ralph’s new bride, Kim, which was most welcome. Thank you, Kim! After watching some cycling DVDs, we turned in and slept very soundly indeed. Good Times... Good Times... and that's just Day 1! WOW you've left your readers hanging and anticipating Day 2! I'm looking forward to reliving the next great climb... and a tasty breakfast. I am glad that your reaction wasn't: "Just Day 1!? Will this never end?" The weather has turned so nice here that I am doing a lot of training on the road but the next chapter of teh Tour de Appalachians will be posted soon!